During their years of active campaigning, the suffragettes would often choose the days on which Parliament reconvened after a recess to hold their own Women’s Parliaments and march on Westminster. As such, while I was deciding when to release The Right of the Subjects I thought that a similar date would be an apt choice, and this flyer was based on those handed out by the WSPU in order to promote their demonstrations, although given that I don’t wish to achieve anything other than the bringing of my book to the attentions of those who’ll enjoy it I had to think very carefully about the wording when I was composing it! In the end I sought the advice of a solicitor (thank you again, Claire-Louise!) who confirmed that my flyer can’t legally be taken as evidence of any unlawful intentions, so I’m sharing it now. Please feel free to do likewise if you wish. 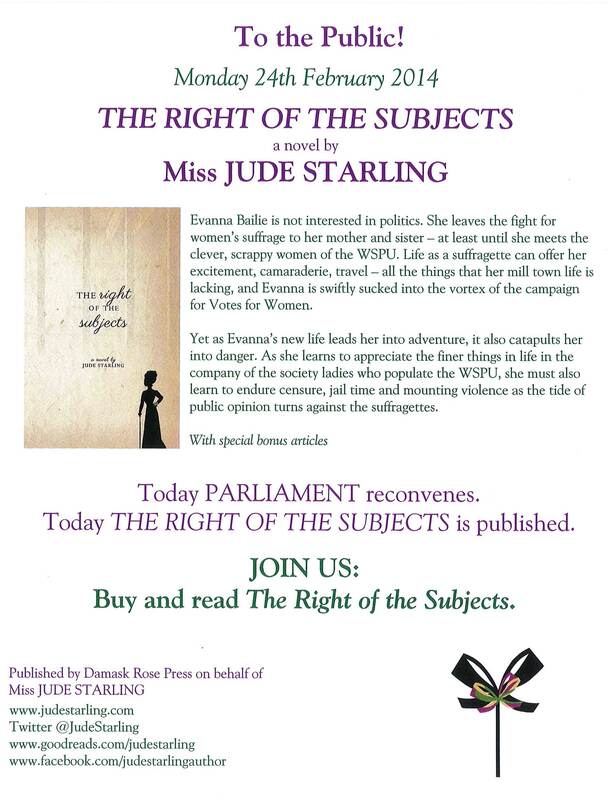 In the first giveaway I’m holding to celebrate the forthcoming publication of The Right of the Subjects, I’m offering a copy signed in purple and green (purple, white and green being the WSPU’s official colours) to be won on Goodreads. Good luck to all entrants, and nil desperandum if you don’t win this time – more copies will be offered as prizes very soon!